Jehova revealed Himself to those elects of old Judea in the times when He felt that it is necessary to do so. Books of Moses were written like that and those books of prophets the same. However, if we limit that such a revelation could be given only to them, St. John’s revelation as the last and never afterward, doesn’t it sound unreasonable? Why can’t Jehova have any elects among those nations which are not Jews? Isn’t hat also thinkable that God is willing to reveal Himself to the Asiatic nations sometimes? Swedenbrog had to explain exactly the same sort of thing while he was woking hard to write down what the Lord has shown him in 18th century. Zeal of these notes is to introduce that we have the same sort of case which has taken place here in Japan since June of 1944. It was in the suite of Shinto shrine Mahgata, in Kohzu-mura, Chiba prefecture, when a Japanese painter Mr. Okamoto was there. He got a kind of shock and painful impulses to write. He wrote down what he himself could not read at all at the beginning. But it was much afterward that those writings were found to be quite valuable. They can be said a revelation of Ameno Hitsukunokami dictated by Hitsukunokami, that is a kind of divine revelation that was given to Japanese nation at the close of the war. 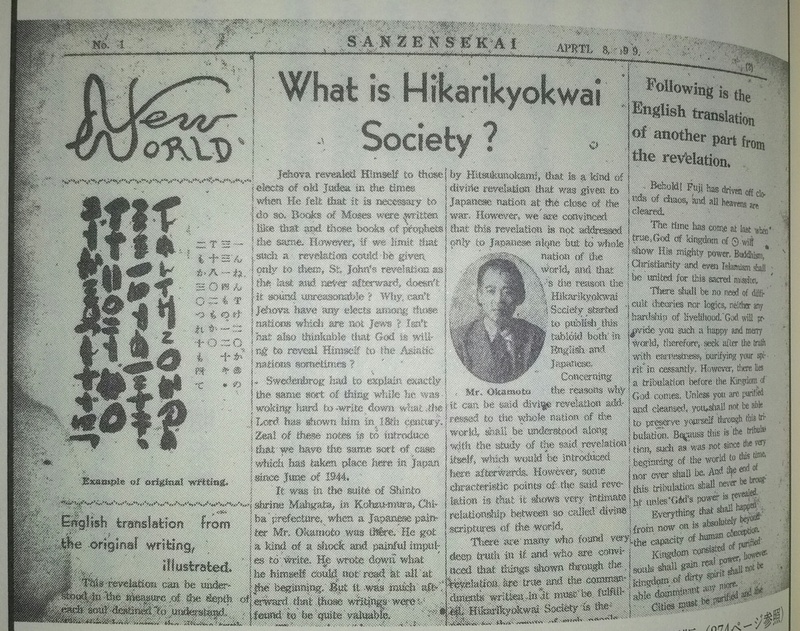 However, we are convinced that this revelation is not addressed only to Japanese alone but to whole nation of the world, and that’s the reason the Hikarikyokwai Society started to publish this tabloid both in English and Japanese. Concerning the reasons why it can be said divine revelation addressed to the whole nation of the world, shall be understood with the study of the said revelation itself, which would be introduced here afterwards. However, some characteristic points of the said revelation is that it shows very intimate relationship between so called divine scriptures of the world. There are many who found very deep truth in it and who are convinced that things shown through the revelation are true and the commandments written in it must be fulfilled. 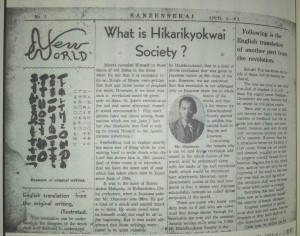 Hikarikyokwai Society is the name to the group of such people. Behold! Fuji has driven off clouds of chaos, and all heavens are cleared. The time has come at last when true God of kingdom of will show His mighty power. Buddhism, Christianity, and even Islamism shall be united for this sacred mission. There shall be no need of difficult theories nor logics, neither any hardship of livelihood. God will provide you such a happy and merry world, therefore, seek after the truth with earnestness, purifying your spirit in cessantly. Hoewver, there lies a tribulation before the Kingdom of God comes. Unless you are purified and cleansed, you shall not be able to preserve yourself through this tribulation. Becauss this is the tribulation, such as was not since the very beginning of the world to this time, nor shall ever be. And the end of this tribulation shall never be brought unles God’s power is revealed. Everything that shall happen from now on is absolutely beyond the capacity of human conception. Kingdom consisted of purified souls shall gain real power, however, kingdom of dirty spirit shall not be able domminant any more. Cities must be purified and the rustic place must be purifies as well, but the most significant of all is the purification of man. SAHIH BUKHARI, Volume 9, Book 88, Number 237. Narrated by Abu Huraira. The traditions of Bukhari are considered the most authentic hadith and were compiled in the 9th century.